The mouthpiece is the more important part of a bit, as it controls the severity of the bit. Thinner mouthpieces are more severe, as are those that are rougher. 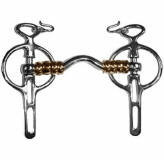 Jointed mouthpiece: applies pressure to the tongue, lips, and bars with a "nutcracker" action. 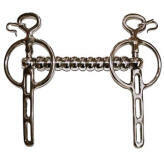 This is the most common mouthpiece found on a snaffle. But, curb bits can also have this mouthpiece. 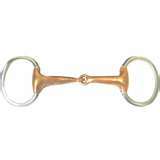 Just because a bit has this mouthpiece does not make it a snaffle. 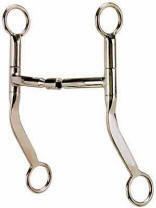 Mullen mouth: made of hard rubber or a half-moon of metal, it places even pressure on the mouthpiece, lips, and bars. It is a very mild mouthpiece. French mouth: a double-jointed mouthpiece with a bone-shaped link in the middle. It reduces the nutcracker action and encourages the horse to relax. Very mild. Dr. Bristol: a double-jointed mouthpiece with a flat rectangular link in the middle. Applies pressure similarly to the French link, although slightly more severe. Slow twist: a single-jointed mouthpiece with a slight twist in it. 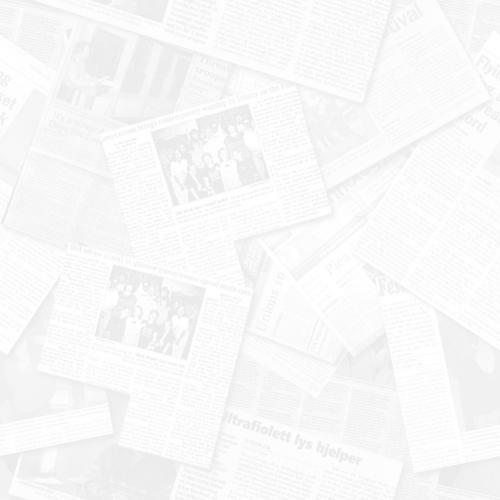 Stronger and more severe. Corkscrew: Many small edges amplifies the pressure on the mouth. Severe. Single- and Double-twisted wire: two of the most severe mouthpieces, as they are not only thin, but they also have a "nutcracker" action from the single joint and the mouthpiece concentrates pressure due to its severe twisting. Roller mouthpieces: tend to make a horse relax their mouth and activate the tongue, encouraging salivation &acceptance of the bit. Hollow mouth: usually single-jointed with a thick, hollow mouthpiece which spreads out the pressure and makes the bit less severe. May not fit comfortably in some horses' mouths if they are a little small.